Foam blank, stringer?, two colour pigment Volan laminate. Post production legrope plug. * Approximate dimensions in italics. approx 7'' x 4'' base. Image below, thanks to Daniel Prior, March 2005. Puchased new in 1971. Bought 18 months later by friend, Bob Hazelton, Sydney. Length probably adjusted for Victorian conditions. #1631973 Pat Morgan Swallow tail 6ft 9'' Kym Thompson. Keel sizes length: 11 ins, height: 5 ins. Flat area around fin sections - some tail lift - Rolled bottom. Handles super well in waves up to 7ft. Over that try a gun keel. Note that the article does not mention the board's Swallow tail, also featured on Jim Pollock's 6ft 8'' Rip Curl surfboard on page 26. 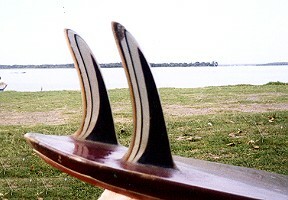 Decor very similar to that of a Twin fin 1 ridden by Corky Carroll in John Severson's Pacific Vibrations, 1971. 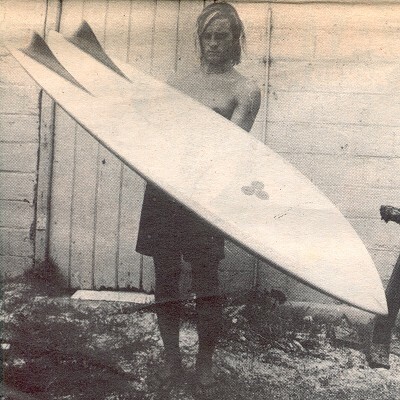 See Walsh Twin fin I # 71. Twin fin 2 see Mark Richards' # 40. CONDITION: 8, black tape -1.